Ramanand Prasad Yadav worked at a glass factory in New Delhi. He toiled hard to earn enough for his large family of wife, four sons, a daughter, his parents, and his three brothers too, bearing the brunt of a family split over ancestral property. But in March 2015 all that changed when he was assaulted one night with acid by a group of ten men while going to his hometown in Bihar. Not only was he robbed of the Rs 3000 that he had on him, but he was also left there by the roadside, writhing in pain all night. In the months that followed, his brother stood in for him at work while his father escorted him from one hospital to another in Muzzafarpur and other towns along the India-Nepal border. A neighbour, who was a vegetable vendor, recommended LVPEI as he had undergone a surgery there. At LVPEI, Dr Bhupesh Bagga and his team performed cornea transplantation surgery in Ramanand’s right eye using Aurokeratoprosthesis - an advanced procedure by which donor cornea is implanted and held in place by a tubular device connecting the front and back of the eye - after first separating the eye lids by the Ankyloblepharon release procedure. 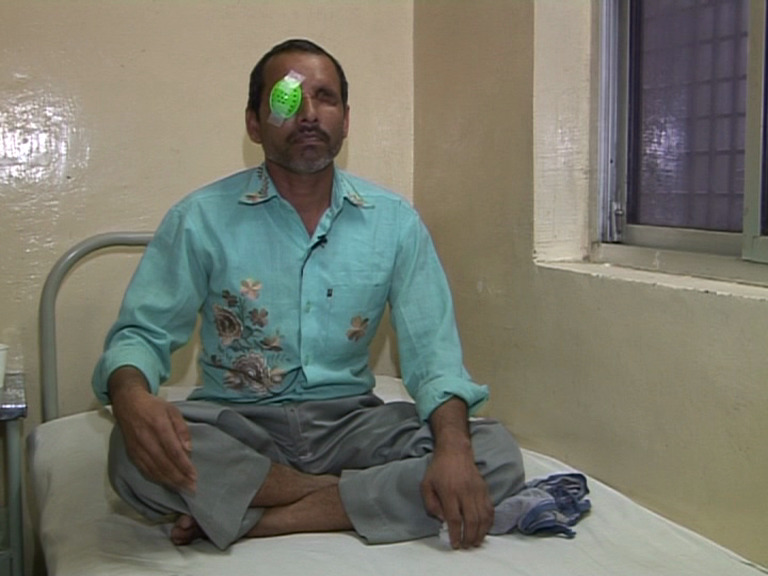 With this Ramanand will have sufficient vision restored in his right eye to function independently at home. Ramanand is grateful to Dr Bagga for achieving something which many other doctors could not, even as he worries that his wife eat a decent meal, his daughter study further beyond matriculation, and that his left eye be fitted with a prosthetic eye. A limbal dermoid is a tiny skin coloured mass projecting from the junction of the white eye ball and black part of the eye. The abnormality appears at birth mostly in one eye but it may involve the second eye too in a third of children. It may lead to decreased vision for the child and be a cosmetic issue. Shantanu Ghosh from Durgapur in West Bengal grew increasingly conscious of the limbal dermoid in his left eye when his classmates started teasing him. 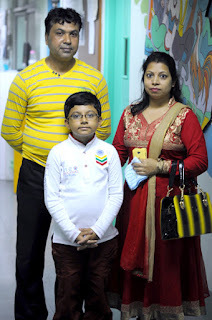 His parents Sutapa and Narayan Ghosh took him to Dr Ganguly, a former consultant with LVPEI, who referred Shantanu to Dr Muralidhar Ramappa at LVPEI Hyderabad. Dr Ramappa performed lamellar keratoplasty, extracted the limbal mass and transplanted a partial human donor cornea tissue to cover the wound. A year later, all sutures were removed. While pursuing his post graduation from Minto Ophthalmic Institute, Bangalore, Dr Akshay Badakare happened to attend a lecture in Hubli where Dr Ramesh Kekunnaya was a speaker and mentioned about the impressive comprehensive fellowship program at LVPEI. At the same time, Dr Akshay’s wife Dr Swathi Badakare attended EyePEP, a program for postgraduate ophthalmology students, hosted by LVPEI. The couple went ahead and applied for the three year comprehensive fellowship program at LVPEI. “The fellowship program at LVPEI is at par with the international standards and undoubtedly the best in the country. Initially, it took us couple of weeks to adjust to the rigorous routine but soon things fall in place. I value not only the academic knowledge that I have gained, but also the important lessons that I have learnt in time management and work-life discipline at LVPEI,” says Dr Akshay. As part of their fellowship, the couple was posted at the peripheral centre, Y Mahabaleshwarappa Memorial Eye Centre in Bellary, Karnataka. “The real challenge at the new centre was to build a rapport with the community and gain their trust. This also made us aware of the various health issues faced by the communities. When Swathi saved a poor, elderly man’s vision by operating him for cataract in his only remaining eye, his entire family turned up to thank us. It was an overwhelming experience that we will cherish for lifetime,” recalls Dr Akshay. Dr Akshay and Dr Swathi have completed their comprehensive fellowship in pediatric ophthalmology and glaucoma respectively in June 2015. They have decided to continue their journey with LVPEI and will soon be joining the institute as consultants.